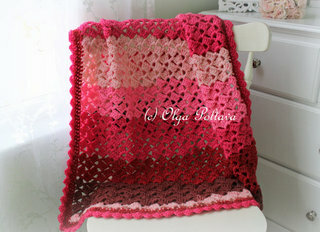 The weather is almost summer-like here in California, and I am in the mood for summer crochet projects. 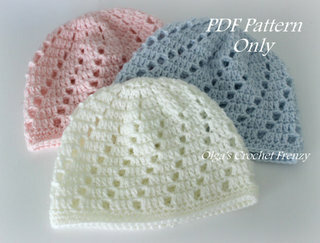 I made these summer baby hats using 100% mercerized cotton (to be exact, I used Grace by Patons). This is a simple and basic pattern. 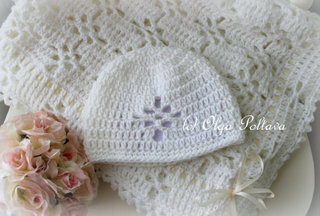 The finished hat can be decorated with crochet or fabric flowers of your choice, ribbons or buttons, or just left as it is. 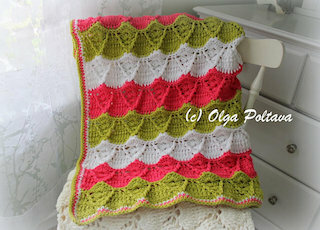 The pattern is available in two sizes: 3-6 months, and 6-12 months. It's available in my Etsy and Craftsy shops. 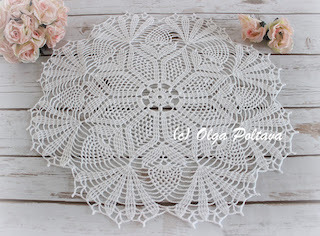 A few years ago I attempted to crochet this doily but gave up. The pattern seemed to complicated and confusing to me. 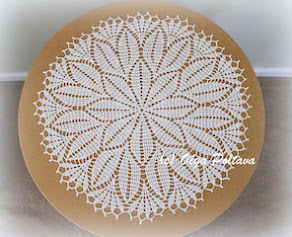 But it is one of the most beautiful doilies I've ever seen, so I decided to give it another try. And my attempt was successful! It doesn't look too difficult, yet it's not an easy pattern. Up to the 7th round, it's fine. But then it gets complicated. Yet I managed to get through it... Until I got to the 26th round! That round simply drove me insane. I tried over and over, and yet couldn't follow through with it. So I made my own variation of the last round. It looks very similar to the original pattern, but it's much easier. 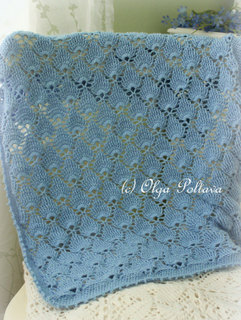 At the end of the pattern I included my modified/simplified 26th round. 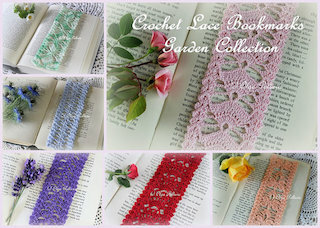 I used size ten cotton crochet thread and size 1.25 mm crochet steel hook. 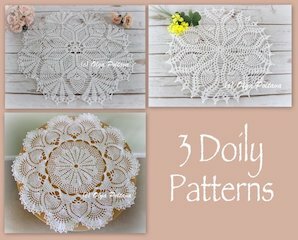 My doily came out 26 inches in diameter. 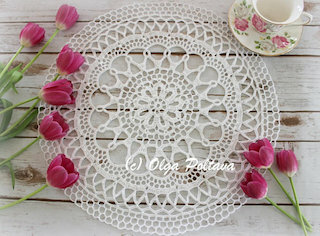 The patter for this doily is from Star Doily Book #137, by American Thread Company. Chain (ch) 6, join to form a ring, ch 6, double crochet (d c) in ring, * ch 3, d c in ring, repeat from * 5 times, ch 3, join in 3rd stitch (st) of ch. 2nd Round. Slip stitch (sl st) into loop, ch 4 (counts as 1 treble crochet [tr c]), 4 tr c in same space keeping last loop of each st on hook, thread over and pull through all loops at one time, * ch 5, 5 tr c cluster st in next loop (5 tr c cluster st: 5 tr c in same space keeping last loop of each st on hook, thread over and pull through all loops at one time), repeat from * 6 times, ch 5, join in top of 1st cluster st.
3rd Round. Sl st into loop, ch 4, 2 tr c, ch 2, 3 tr c in same space, * ch 3, 3 tr c, ch 2, 3 tr c in next loop, repeat from * 6 times, ch 3, join in 4th st of ch. 4th Round. Ch 4, tr c in same space, 1 tr c in each of the next 2 tr c, * ch 2, 1 tr c in each of the next 2 tr c, 2 tr c in next tr c, ch 3, 2 tr c in next tr c, 1 tr c in each of the next 2 tr c, repeat from * all around ending to corre­spond, ch 3, join. 5th Round. Ch 4, tr c in same space, 1 tr c in each of the next 3 tr c, * ch 2, 1 tr c in each of the next 3 tr c, 2 tr c in next tr c, ch 4, 2 tr c in next tr c, 1 tr c in each of the next 3 tr c, repeat from * all around ending to corre­spond, ch 4, join. 6th Round. Ch 4, 1 tr c in each of the next 4 tr c, * ch 2, 1 tr c in each of the next 5 tr c, ch 2, tr c in next loop, ch 4, 1 tr c in each of the next 5 tr c, repeat from * all around ending with ch 2, tr c in next loop, ch 4, join. 7th Round. Ch 4, 1 tr c in each of the next 4 tr c, * ch 2, 1 tr c in each of the next 3 tr c, 2 tr c cluster over next 2 sts (2 tr c cluster: 1 tr c in each of the next 2 sts keeping last loop of each st on hook, thread over and work off all loops at one time), ch 3, skip the next loop, tr c in next loop, ch 4, 2 tr c in next tr c, ch 4, 1 tr c in same space as last st worked in and in next tr c keeping last loop of each st on hook, thread over and work off all loops at one time, 1 tr c in each of the next 3 tr c, repeat from * 6 times, ch 2, 1 tr c in each of the next 3 tr c, 2 tr c cluster over next 2 tr c, ch 3, skip next loop, tr c in next loop, ch 4, 2 tr c in same space with ch 4, ch 4, join in 1st tr c.
8th Round. Ch 4, 1 tr c in each of the next 3 tr c, * skip next loop, 1 tr c in each of the next 2 tr c, 2 tr c cluster over next 2 sts, ch 4, skip next loop, tr c in next loop, ch 4, 1 tr c in each of the next 2 tr c, ch 4, tr c in next loop, ch 4, 2 tr c cluster over next 2 sts, 1 tr c in each of the next 2 tr c, repeat from * all around ending to correspond, join in 1st tr c.
9th Round. Ch 4, 1 tr c in each of the next 3 tr c, 2 tr c cluster over next 2 sts, * ch 4, tr c in next loop, repeat from * once, ch 3, 1 tr c in each of the next 2 tr c, ch 2, 2 tr c, ch 1, 2 tr c in same space as last st worked in, ch 3, skip next loop, tr c in next loop, ch 4, 2 tr c cluster over next 2 sts, 1 tr c in each of the next 2 tr c, 2 tr c cluster over next 2 sts, repeat from 1st * all around ending to correspond, join in 1st tr c.
10th Round. Ch 4, 1 tr c in each of the next 3 sts keeping last loop of each st on hook, thread over and pull through all loops at one time, * ch 4, tr c in next loop, repeat from * once, ch 3, skip next loop, 1 tr c in each of the next 2 tr c, ch 4, 2 tr c in next tr c, tr c in next tr c, ch 2, tr c in next tr c, 2 tr c in next tr c, ch 3, skip next loop, tr c in next loop, ch 4, 1 tr c in each of the next 4 sts keeping last loop of each st on hook, thread over and work off all loops at one time, repeat from 1st * all around ending to correspond, join in 1st tr c.
11th Round. Ch 8, * tr c in next loop, ch 5, 6 tr c cluster st in next loop (6 tr c cluster st: 6 tr c in same space keeping last loop of each st on hook, thread over and work off all loops at one time), skip next loop, 1 tr c in each of the next 2 tr c, ch 4, tr c in next loop, ch 4, 2 tr c in next tr c, 1 tr c in each of the next 2 tr c, ch 2, 1 tr c in each of the next 2 tr c, 2 tr c in next tr c, ch 3, skip next loop, tr c in next loop, ch 4, tr c in top of next cluster st, ch 4, repeat from * all around ending to correspond, join in 4th st of ch. 12th Round. Sl st into loop, ch 8, tr c in next loop, ** ch 3, 1 tr c in each of the next 2 tr c, * ch 4, tr c in next loop, repeat from * once, ch 2, 2 tr c, ch 4, 2 tr c in next tr c, 1 tr c in each of the next 3 tr c, ch 2, 1 tr c in each of the next 3 tr c, 2 tr c in next tr c, ch 4, skip next loop, tr c in next loop, * ch 4, tr c in next loop, repeat from * once, then repeat from ** all around ending to correspond, join in 4th st of ch. 13th Round. Ch 4 (counts as 1st tr c) and complete a 6 tr c cluster st in same loop, ** skip next loop, 1 tr c in each of the next 2 tr c, * ch 4, tr c in next loop, repeat from * once, ch 3, skip next loop, 1 tr c in each of the next 2 tr c, ch 4, tr c in next loop, ch 4, 2 tr c cluster st over next 2 tr c, 1 tr c in each of the next 3 tr c, ch 2, 1 tr c in each of the next 3 tr c, 2 tr c cluster st over next 2 tr c, * ch 4, tr c in next loop, repeat from * once, ch 5, 6 tr c cluster st in next loop, repeat from ** all around ending to correspond, join in 1st tr c.
14th Round. Ch 4, tr c in next tr c, ** ch 4, tr c in next loop, ch 5, 6 tr c cluster st in next loop, skip next loop, 1 tr c in each of the next 2 tr c, * ch 4, tr c in next loop, repeat from * once, ch 4, 2 tr c cluster over next 2 sts, tr c in next tr c, 2 tr c in next tr c, ch 1, 2 tr c in next tr c, tr c in next tr c, 2 tr c cluster over next 2 sts, * ch 4, tr c in next loop, repeat from * twice, ch 3, 1 tr c in each of the next 2 tr c, repeat from ** all around ending to correspond, join in 4th st of ch. 15th Round. Ch 4, tr c in next tr c, * ch 4, tr c in next loop, repeat from * once, ch 3, 1 tr c in each of the next 2 tr c, * ch 4, tr c in next loop, repeat from * twice, ch 4, 2 tr c cluster over next 2 sts, 1 tr c in each of the next 2 sts, skip next ch 1 space, 1 tr c in each of the next 2 tr c, 2 tr c cluster over next 2 sts, * ch 4, tr c in next loop, repeat from * once, ch 5, 6 tr c cluster st in next loop, skip next loop, 1 tr c in each of the next 2 tr c, repeat from 1st * all around ending to correspond, join. 16th Round. Ch 4, tr c in next tr c, * ch 5, tr c in next loop, ch 5, 6 tr c cluster st in next loop, skip next loop, 1 tr c in each of the next 2 tr c, * ch 4, tr c in next loop, repeat from * 3 times, ch 4, 2 tr c cluster over next 2 sts, 1 tr c in each of the next 2 sts, 2 tr c cluster over next 2 sts, * ch 4, tr c in next loop, repeat from * twice, ch 3, 1 tr c in each of the next 2 sts, repeat from 1st * all around ending to correspond, join. 17th Round. Ch 4, tr c in next tr c, * ch 4, tr c in next loop, repeat from * once, ch 3, 1 tr c in each of the next 2 tr c, * ch 4, tr c in next loop, repeat from * 4 times, ch 4, 4 tr c cluster over next 4 sts, * ch 4, tr c in next loop, repeat from * once, ch 5, 6 tr c cluster st in next loop, skip next loop, 2 tr c cluster over next 2 sts, repeat from 1st * all around ending to correspond, join in 1st tr c.
18th Round. Ch 8, tr c in next loop, * ch 5, 6 tr c cluster st in next loop, skip next loop, 2 tr c cluster over next 2 sts, * ch 4, tr c in next loop, repeat from * 8 times, ch 4, tr c in next cluster st, ch 4, tr c in next loop, repeat from 1st * all around ending to correspond, join. 19th Round. Sl st to center of loop, ch 8, tr c in next loop, ** ch 4, tr c in next cluster st, * ch 4, tr c in next loop, repeat from * 11 times, repeat from ** all around ending to correspond, join. 20th Round. Sl st to center of loop, ch 9, tr c in next loop, * ch 5, tr c in next loop, repeat from * 3 times, ** ch 5, 6 tr c cluster st in next loop, * ch 5, tr c in next loop, repeat from * 11 times, repeat from ** all around, ending to correspond, join. 21st Round. 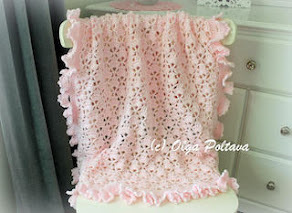 Sl st to center of loop, ch 9, tr c in next loop, * ch 5, tr c in next loop, repeat from * once, ** ch 5, 6 tr c cluster st in next loop, ch 5, 6 tr c cluster st in next loop, ch 3, 3 double treble crochet (d tr c [3 times over hook]) with ch 3 between each d tr c in next cluster st, ch 3, 6 tr c cluster st in next loop, ch 5, 6 tr c cluster st in next loop, * ch 5, tr c in next loop, repeat from * 8 times, repeat from ** all around ending to correspond, join. 22nd Round. Sl st to center of loop, ch 9, tr c in next loop, ** ch 5, 6 tr c cluster st in next loop, ch 5, 6 tr c cluster st in next loop, * ch 5, tr c in next loop, repeat from * twice, ch 5, d tr c in next d tr c, * ch 5, tr c in next loop, repeat from * twice, ch 5, 6 tr c cluster st in next loop, ch 5, 6 tr c cluster st in next loop, * ch 5, tr c in next loop, repeat from * 5 times, repeat from ** all around ending to correspond, join. 23rd Round. Sl st to center of loop, ch 4 and complete 6 tr c cluster st in same space, ** ch 5, 6 tr c cluster st in next loop, * ch 5, tr c in next loop, repeat from * 4 times, ch 5, d tr c in next d tr c, * ch 5, tr c in next loop, repeat from * 4 times, ch 5, 6 tr c cluster st in next loop, ch 5, 6 tr c cluster st in next loop, * ch 5, tr c in next loop, repeat from * twice, ch 5, 6 tr c cluster st in next loop, repeat from ** all around ending to correspond, join in top of 1st cluster st.
24th Round. Sl st to center of loop, ch 9, tr c in next loop, * ch 5, tr c in next loop, repeat from * 4 times, ** ch 5, d tr c in next d tr c, * ch 5, tr c in next loop, repeat from * 6 times, ch 5, work a 6 tr c cluster st in each of the next 4 loops with ch 5 between each cluster st, * ch 5, tr c in next loop, repeat from * 6 times, repeat from ** all around ending to correspond, join in 4th st of ch. 25th Round. Sl st to center of loop, ch 9, tr c in next loop, * ch 5, tr c in next loop, repeat from * 4 times, ** ch 5, d tr c in next d tr c, * ch 5, tr c in next loop, repeat from * 18 times, repeat from ** all around ending to correspond, join. 26th Round. Ch 12, rice st in 8th st from hook (rice st: 3 tr c in same space keeping last loop of each st on hook, thread over and pull through all loops at one time), d tr c in next tr c, ch 8, rice st in top of d tr c just made, tr c in next tr c, ch 8, rice st in top of tr c just made, sl st in next tr c, ** ch 8, rice st in same space with sl st just made, tr c in next tr c, ch 8, rice st in top of tr c just made, d tr c in next tr c, ch 8, rice st in top of d tr c just made, tr c in next tr c, ch 8, rice st in top of tr c just made, sl st in next d tr c, * ch 8, rice st in same space with sl st just made, tr c in next tr c, ch 8, rice st in top of tr c just made, d tr c in next tr c, ch 8, rice st in top of d tr c just made, tr c in next tr c, ch 8, rice st in top of tr c just made, sl st in next tr c, repeat from * 3 times, repeat from ** all around ending to correspond, join, cut thread. My modified/simplified 26th Round. Ch 12, rice st in 8th st from hook (rice st: 3 tr c in same space keeping last loop of each st on hook, thread over and pull through all loops at one time), tr c in next tr c, ch 8, rice st in top of tr c just made. 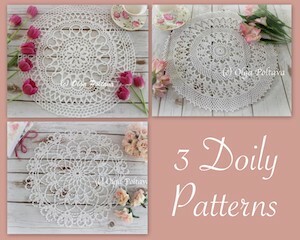 Then simply make *tr c in next tr c (or d tr c), ch 8, rice st in top of tr c just made* all the way around your doily. It’s much simpler, but it looks close to the original pattern. The first signs of early spring begin to show here in Northern California, and I'm getting into the spring mood. I really like this variegated mint green thread. I've made a few projects from it before. And this is the latest one! 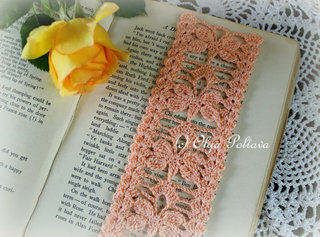 I think this bookmark is very spring-like! 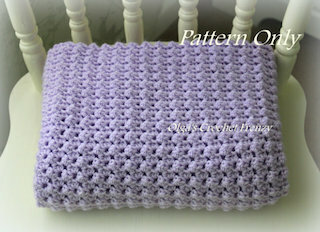 The finished size is approximately 8.5 inches long and 2.5 inches wide. 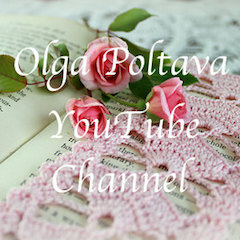 I used size ten cotton thread and size 1.25 mm hook.